How doe Anya Inspire you? Anya has been through a very tough year. On February 11, 2018 she was diagnosed with Type 1 diabetes and due to complications she almost died. Soon after she got the flu and broke her foot. (Tough month) She has handled her medical issues with such grace and strength and has become a Youth Ambassador for JDRF. She sometimes has bad days but does not let this disease slow her down. If someone wants to know about his/her experience, what's the best way to ask/learn about it? :Anya is very open to answering questions about her illness when genuinely asked. She wears a continuous glucose monitor to manage and keep track of her blood sugars so she can try to keep it in a healthy range. She answers questions readily when people ask her but when she gets asked, "What's wrong with you?" she will sometimes use her sense of humor and has a list of things she tells people instead, like she was a bad kid and her mother put a tracking device on her like a gps, aliens abducted her and she came back with this thing on her or that its a secret government project and if she told you about it she would have to kill you. How have other kids (friends, family, classmates) learned from your child? : Anya has talked to her class and her friends about her illness. She has also become a Youth Ambassador for JDRF (Juvenile Diabetes Research Foundation) and has talked to people at fundraisers at Marshalls stores about her illness and how she manages it. She will talk about the differences between type 1 and type 2 and the management of each. She will tell people that because she has type 1 she can eat anything, except poison and poison cookies and that she is the same kid she was before diagnosis except with a dysfunctional pancreas. What goals and dreams does your child have? : Anya's long term goal is to be a police officer or own a shop that does event planning and weddings. She rides horses and next year she plans to go to the POA National Congress and ride and show 2 different ponies. Anya has also worked with a dog trainer and is training her own diabetic alert service dog and hopes that he will be able to go to school with her one day. What are your favorite strengths/ characteristics in your child (top two? : It's hard to just pick two! This year I have learned that my child has an amazing sense of humor and a quiet strength that I never knew was possible! We all learn from our children... what is the most memorable lesson your child has taught you? :On February 11, 2018 Anya was rushed to the hospital and was suffering from diabetic ketoacidosis. We had no idea that she was that sick and thought she had the flu. She was incoherent. For the next 24 hours she was in and out of consciousness and at times had no idea who I was or where she was. When she finally came out of it and we told her about her diagnosis, she cried and said, "I'm glad I have it. God gave it to me because he knew I could handle it and that means I saved another child from getting it, because he wouldn't do that to too many kids." Even being as sick as she was she showed me that she can handle anything. Every day since then I have been amazed by her strength! I am so excited to share about this amazing boy! From the moment you meet him he draws you in with his joy and enthusiasm for life. 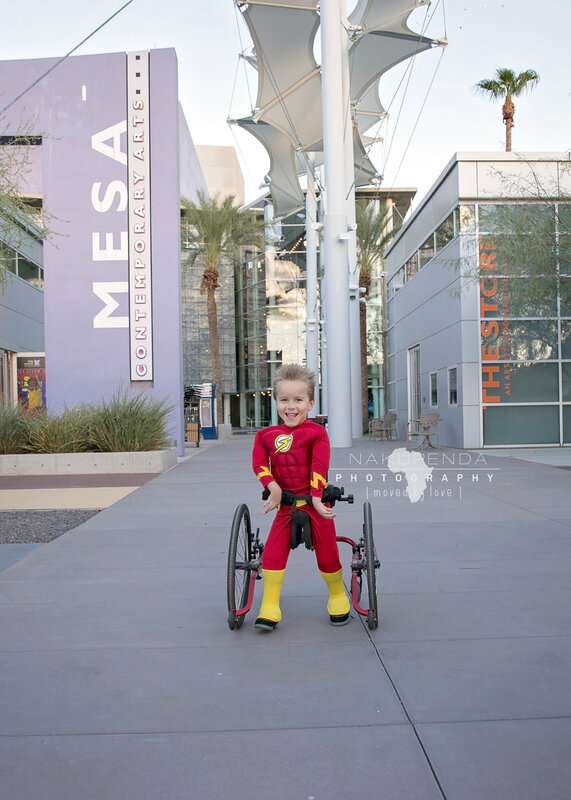 It was an absolute pleasure getting to photograph Silas as one of his favorite superhero. We reached out to mom and were so excited when she agreed to let him be featured. Please start by telling us how your child inspires you/those around you. : He always has a smile on his face and makes those around him feel comfortable. He never gives up.... he is always determined to find a way no matter what he puts him mind to. Who does your child look up to? : His "Bruder" (who is an Army Soldier) and his Grampy. If someone wants to know about his/her experience, what's the best way to ask/learn about it? : He was born with a very rare condition called Arthrogryposis Multiplex Congenita (AMC). The best way to learn about him and his experience is to ask questions.... he is an awesome little guy with an amazing story, we are always happy to share. How have other kids (friends, family, classmates) learned from your child? : That there is no handicap or disability that limits your inner beauty. And that there is NO limit to what one can do, accomplish or achieve with the right attitude. To accept our differences.... that is what truly makes us who we are. He wears his surgery scars with pride knowing that those make him who he is.... One of a kind. What goals and dreams does your child have? : He wants to grow up to be fast like Flash. And he wants to be an artist of all things.... drawing, painting and of music. And he wants to be a real baseball player. What’s your favorite memory of them? : When he breathed, the docs weren't certain if he would ever make it home. Daily.... when he is in the backseat of the car, singing every lyric to every song that plays on the radio. What are your favorite strengths/ characteristics in your child (top two? : He wants to do learn and everything on his own. He never gives up!! And he doesn't see himself as disabled.... he's just built different. He’s taught me to live in the moment and appreciate the small details in life. Showing off his run, jump, spin move.